Across virtually every industry, musculoskeletal disorders (MSDs) represent the most prevalent threat to workers and the most costly injury type for employers. A collection of injuries that includes strains, sprains, and other overexertion or stress incidents, MSDs can derive from causes both acute and chronic. In the construction industry, the problem is especially severe—estimates suggest that work-related MSDs may affect construction workers at a rate of up to 30% nationally. For employers, MSDs in the construction business can introduce staggering costs. Each year, costs from injuries to construction workers amount to $11.5 billion in the United States, a number that only looks worse when paired with the indirect costs of lost work days, decreased productivity, and the lingering effects of chronic pain after an MSD-type injury occurs. Construction sites are highly prone to accidents, and many of the tasks required of workers are physically strenuous and can introduce overexertion stress if a worker’s technique is incorrect or if they are forced to work with poorly designed equipment. Some companies have found success in dealing with the MSD problem among their construction workers by initiating proactive plans toward addressing factors that introduce injury risk at job sites. By setting goals and implementing holistic, data-informed strategies, an organization can mitigate the risk sources to their construction workers and make a measurable impact on injury rates and the significant costs associated with MSDs. A 2009 study in Applied Ergonomics makes a strong case for implementing ergonomics as a strategy for avoiding MSDs. 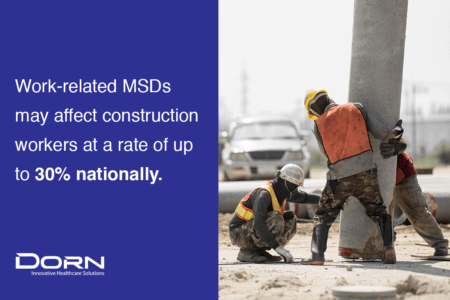 A construction company observed a high rate of MSD among its workers, and upon reviewing the human and financial costs of these injuries, decided to take steps to alleviate the overexertion pressures that employees had experienced. After a thorough ergonomic review of the work environment, the company found that one task in particular was contributing to MSD injuries at an abnormal rate: lifting ladders onto company vehicles. The exertion required for this task places strain on workers’ backs and shoulders, as the heavy ladders had to be lifted well above the head. This combination of exertion and extension is a common recipe for MSDs, and it also introduced slip and fall injury risks, since workers often had to stand on the bumper of the van in order to reach the ladder mount. After the review, the company implemented a new hydraulic ladder lift technology that assisted employees in attaching ladders to their vehicles. The new lift reduced the compression force placed on the workers, alleviating the risk of MSD injuries. Employees reported much greater comfort with the new innovation, and the new lift became sought-after when other companies witnessed its benefits at job sites. Dow Chemical Company launched a ten-year plan, beginning in 2000, targeting a 90 percent decrease in illness and injury rates to the workers in their Design and Construction unit. For this initiative, the company targeted 1,250 employees, most of whom worked at desktop workstations, seated at computers for long portions of the day – a very common set of circumstances for MSD injuries. This case is a valuable example in how a proactive approach can mitigate risk within a workforce through ergonomic improvements. At Dow, it was discovered in the analysis and observation phase that much of the risk in this particular workplace came from a lack of ergonomically sound equipment. Poorly designed, non-adjustable desk furniture was seen as a major source of MSD risk for employees, as was a general lack of understanding among workers about how ergonomics affects their health on a daily basis. To address the problem, Dow overhauled their office furniture sets and replaced outdated equipment with modern alternatives. More importantly, the company created a series of educational materials, including testimonials from workers who had dealt with workplace injuries. Likewise, they streamlined their reporting processes so that a worker would have an easy point of contact when they encountered any kind of discomfort in the workplace. The result? A 64 percent decrease in measurable workplace risk factors, and a significant drop in the severity of remaining workplace injuries. Introducing pain and injury treatment options at the actual work site is an excellent way not only to help workers through the results of MSD incidents—it can also help prevent the injuries in the first place. By placing qualified health personnel on site, you can provide workers with an immediate resource when they feel pain or discomfort, treating the problem in the moment and creating an opportunity to correct whatever environmental hazard or behavioral issue is causing the complaint. Many companies have had success in keeping their workers healthy by making daily stretching a requirement for all employees. Stretching is a critical element in MSD prevention—since the leading causes of MSDs at construction sites are repetitive motion or strenuous motion, it’s essential that workers stretch before starting the day to prepare their bodies for the coming workload. Stretching is also a valuable component of an overall culture of wellness at the job site, which encourages workers to take charge of their health. Having on-site health and safety personnel in close proximity to construction workers promotes a healthy work environment and a culture in which workers feel cared for and valued. On-site coaching and observation can help to isolate risk areas and correct problematic behaviors before they lead to MSDs, chronic pain, and lost work days. Personal protective equipment is one vital aspect of all construction projects, but ergonomics is often forgotten. Simple equipment changes such as providing tools that allow workers to stand rather than bend to perform their tasks can have a real impact on workplace safety. Equipment designed with ergonomics in mind can prevent workers from overexertion and remove the physical stress that comes from performing strenuous tasks at difficult angles or in uncomfortable positions. Training is a vital element of a strong workplace safety culture, and education is the first line of defense against overuse and stress injuries. A proactive approach to safety education can arm your workers with the knowledge they need to take care of themselves at the job site. Teach employees about the proper behaviors and techniques to accomplish their tasks, while reinforcing the importance of best practices and self-awareness on the job site. To go even further, many firms are introducing Ergonomic Awareness training to all employees to help bring the front-line workers to a point where they can detect and report risks. Also, developing safety messaging both digital and printed can help instill safe and productive behaviors and shift responsibility to the workers. Technology has provided companies with a wealth of resources that can help keep workers safe. In the construction realm, it’s essential to utilize basic technological equipment such as harnesses and lifelines and ensure that these are kept in functional condition at all times, services that an on-site review can easily provide. 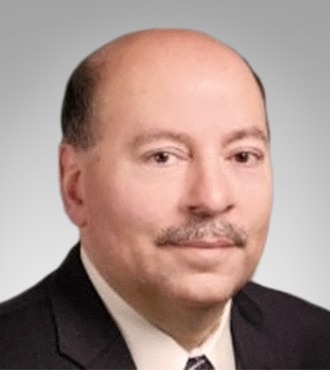 However, new technologies such as artificial intelligence have allowed companies to evaluate both their workers and the work environment simultaneously, detecting risk factors and alerting management so that hazards can be removed and problematic worker technique can be corrected in real-time. Technology to identify fatigue can identify risks before the employee starts their day, helping to drive down injuries and overall risk. More and more organizations are implementing POET to ensure that employees have the ability and agility to successfully perform job tasks that require a high level of physical exertion. These tests are designed by a Certified Industrial Ergonomist and are completed either at a clinic or on site if the proper safeguards are in place. POETs are conducted after a conditional job offer is made, but before starting work. They can screen out candidates who cannot perform the physical job demands, reduce work-related injuries, and gather baseline data in motion, strength, and functional status. This supports the adage that the least costly injury is the one that never happens. In construction more than perhaps any other industry, companies must be proactive and ever-aware of the constant risks of the job. By implementing a holistic approach and isolating the root causes of MSD injuries, construction companies can create a culture of wellness, helping to make employees feel safe and cared for on the job. That kind of engagement itself is a safety factor, as workers who are tuned-in to safety practices and actively engaged in their work are more likely to remain safe and provide better, more productive work.